Imagine reading this somewhere, or hearing about it. What would your first reaction be? If so, relax! This notice wasn’t issued by those fanatics, but by a renowned semi-government university, and is applicable only within its premises. It all began when a notice was issued by Bahria University’s (BU) director, requiring male and female students to keep a six-inch distance when sitting or standing near each other. This is not even the worst part though, as the notice also called to enforce a “no touch” policy between male and female students. This is not the first time my alma mater has been in the news for all the wrong reasons. There was a jeans controversy a few years ago, where wearing jeans was prohibited in the Bahria prison… I mean university. Deeming this ban to be unfair, scores of students gathered in the campus lobby to protest this policy, chanting “we want jeans”. The ban was ultimately withdrawn with a few new restrictions, but not before the totalitarian regime running the university had kicked the instigators out. None of this moral policing is unfortunately new in Pakistani institutions as there have been numerous other cases. For instance, a female lecturer at the Institute of Business Management (IoBM) in Karachi came forward last year after being harassed by the university guard over what was perceived as indecent dressing by him. Abrasive moral policing is routinely carried out in large public sector universities such as the Punjab University and Karachi University as well, where radical student unions are also accused of bullying students into submitting to their ideas of morality. The National University of Science and Technology (NUST) too has made headlines in the past for reinforcing a certain dress code on its students, contrary to their will. Thus, what Bahria University did is not a new addition to the spectrum, but is the latest contribution to the already alarming moral policing culture that exists in the country. This time around, it seems the university has completed its transition to a madrassa, for that is what the university comes across as, rather than a modern-day higher education institute. No other institution comes close to having adopted a rule this regressive and medieval in nature, which is precisely why it was immediately picked up by the mainstream media. I contacted the public relations department of the university to get their narrative, but they had no comment to make. However, a spokesperson did give a feeble rationale for the move to the media, claiming it was to ensure the protection of religious and ethical values. The question of how they plan on achieving that by ordering a six-inch distance remains unanswered. After all, why not 10 inches? Or a mile? Moreover, are the students supposed to carry a measuring tape with them at all times, just to measure the distance they keep with the opposite gender, instead of focusing on their studies? Now take inchtap to the university in the month of #Ramazan to have six inches of distance. Because Bahria University has issued orders that girls must keep distance of 6 inches when sit with boys. Perhaps the notice could have entailed, ‘male and female students must respect religious and cultural values at all times’; the intention could have been articulately conveyed in a much more appropriate manner, and there would be no outcry. On the other hand, enforcing this ridiculous policy seems to be the work of some narrow-minded moral police who clearly do not know what they are doing. It is almost as if the director of Bahria wasn’t entirely satisfied with the already heightened levels of intrusion in students’ personal spaces in the university. Universities cannot operate under such draconian measures. How will these students fare as per global standards, especially when it comes to interaction with people from diverse ethnic, cultural and linguistic backgrounds, when they have been indoctrinated through ridiculous rules based on gender segregation? Such rules hamper creativity and pave way for batches upon batches of students devoid of free thought, exposure, unable to thrive in the rapidly changing dynamic of a world shaped by science and technology. Students also find themselves unable to work in challenging situations, to think out of the box and be good problem solvers, all owing to the excessively controlled environment they just spent four years in. What’s more alarming is that this absurd policy has dragged the university’s name down the dirt, popularising it as the “six-inch university”. After getting labelled as students of the ‘six-inch university’, who would hire these students? What will happen to their career placements? I reached out to several of my instructors for their thoughts on this matter, and though they wished to remain anonymous, they certainly had a lot to say. An assistant professor bashed the director and blamed him for defaming the university’s name. He suggested that this typical mindset represented by former Navy personnel hired to run the institute is simply not compatible with the environment of a contemporary higher education institution. According to him, this is why policies that are entirely uncharacteristic of progressive academic culture are being created and implemented. A visiting lecturer of finance was also critical of the management, and believed the matter should be rectified before it gets picked up by the international media, which definitely would not be in the university’s best interests. 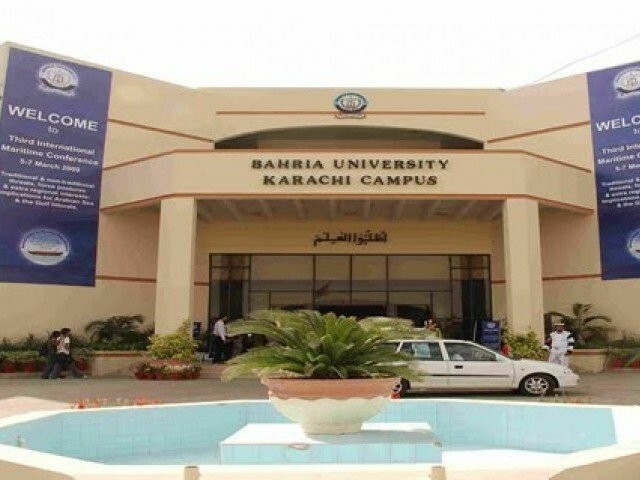 So, what exactly is wrong with Bahria University? Or does the fault lie with the people who are running it? Having spent four years at the university, I have witnessed the authoritarian attitude of the administration first-hand, which is reflected in the fascist policies and rules implemented in the name of discipline. Another problem is the current administration has no marvels to show for its tenure, nor has it taken any measures to improve academics, which reflects in the fact that there has been no improvement in the university’s Higher Education Commission (HEC) rankings either. Today, it ranks below the relatively unknown Hazara University and Jamshoro University. Instead of doing something about the deteriorating quality of education of the institute, the administration may have made this move simply to deflect attention from its poor performance. However, given the adamant attitude of the university’s representative and the rigid nature of the brass running the institution, it is highly unlikely the university will withdraw the notice. The six-inch rule is the product of rigid, narrow-minded individuals who have no experience in running educational institutions, but opted to run a higher education institute. If the administration of an institute is unqualified or incapable of understanding what it takes to run a good university and shape the leaders of the future, all they end up making is a mockery out of our education system. Mister where are you living, in Sydney or in Puerto Rico? Seems that you are quite away from the religious values and morals that make one’s character better in this society. I feel there is nothing wrong while making these rules, we should abide by these rules even though it’s some month other than Ramadan. The original name of Pakistan is Islamic Republic of Pakistan which makes us responsible for every little wrong to every big trouble, by calling these rules as talibanized-versions or modern society hampering rules you are just making it worse. Freedom of expression is one of the greatest values but this must be within the boundaries of respect for the religious beliefs and cultural sensitivities of others.Eisenhower once said, “A people that values its privileges above its principles soon loses both”. Let’s not forget what our great leader Allama Iqbal quoted once, “People who have no hold over their process of thinking are likely to be ruined by liberty of thoughts”. the decision by university is a laughing stock, childish , stupid, absurd, impractical. call it whatever you want. A good piece of work & well (social media) researched. :) Yes of course, university is not place where you go to learn your religious and ethical values, (please ask your parents to teach them if someone has issue with my second line). I don’t know why our state and institutions always try to become a Baap (father) of us (nation). I think this is the time to tell them “hey! just do your job properly, i know what is right & what is wrong”. @Author! U r absolutely right. I think now I would also have to hide my identity about being former student of BU. At our time, there was uniform for both male and female students but there were no such rubbish policy-making. It all started in 2005-06 when a whole bunch of molvees were appointed as teachers. It was looking very awkward when u r going for the first time into the classes of Adv. Algorithms or Operating Systems and a teacher is standing with long beard and a turban on head, with loose and casual shalwar-qameez and shalwar is too short that it more looks like Shalwar Capri. While talking to girls, the teacher is not making any eye-contact and staring into the ceilings. Keeping a reasonable distance and maintaining a dress code is not Talibanization at all. Both advises are clearly mentioned in Quran. Regularizing and maintaining moral disciplines is in every society and religion. Why there is so much hue and cry??? the students in university are older than 18 years. they are adults the point should be that they should be allowed to make their own decisions and not be forced and have morality thrust upon them. what is between them and their god and their beliefs should be allowed for their own judgement. The same way a woman wearing a Hijab should not be bothered the same way a woman wearing jeans and a shirt shouldn’t either.